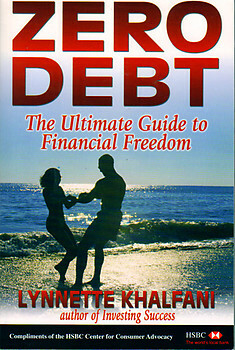 Zero Debt The Ultimate Guide to Financial Freedom Second Edition by Lynnette Khalfani was a book design project including indexing commissioned to AMV by Advantage World Press in 2007. The book is widely available for order on the web via various online retail stores including www.amazon.com, and www.barnesandnoble.com as well as the author’s official web site and social media portal http://themoneycoach.net/home/. IT'S TIME TO FIX YOUR FINANCES! Everyone wants to slash his or her debt, save more money, and become financially secure. Regardless of your situation, you can get on the road to financial freedom - and you can do it yourself in the next 30 days! You can be free from financial worries, rest at night knowing your bills are paid, and have peace of mind when it comes to money matters. It all starts by eliminating excessive debt, and using time-tested strategies to save your hard-earned cash. Zero Debt also helps you put a financial fortress around yourself - offering tips on budgeting, the importance of having insurance, low-cost methods for creating an updated will, creative ways to instantly put dollars in your pocket, and more. If you want to be debt-free and achieve financial freedom, you need an action plan. This book is your step-by-step plan. It's simple. It's easy to understand. And it works. Zero Debt is the one book written by an expert with personal experience beating debt! Personal finance expert and "money coach" Lynnette Khalfani paid off more than $100,000 in credit card debt in less than three years - without bankruptcy, credit counseling, or a debt management plan. Now she teaches individuals nationwide how to get out of debt, save money and invest for the future. Lynnette has shared her secrets on The Dr. Phil Show, The Jane Pauley Show, The Tavis Smiley Show, and other national TV and radio programs. A former Wall Street Journal reporter for CNBC, Lynnette has also been featured in numerous print publications including The New York Times and USA Today. Visit her web site at www.themoneycoach.net.